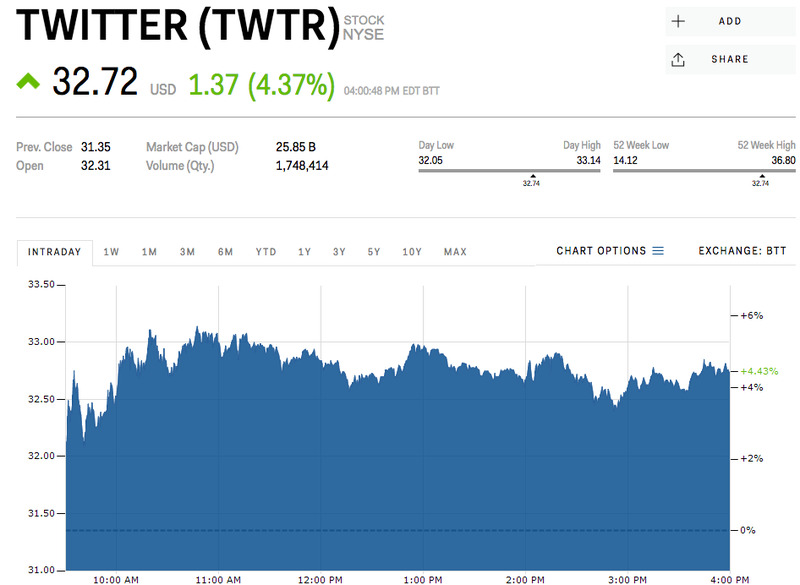 Twitter rebounded after negative news out Tuesday battered the stock. Twitter and other social media stocks outperformed the Nasdaq. Watch Twitter shares in real time here. Twitter shares rallied Wednesday, gaining 4.37% to $US37.72 apiece, despite weakness in the tech-heavy Nasdaq. Twitter, like Facebook and Snap, has received negative attention regarding its platform recently.Shares sank more than 10% Tuesday after Bloomberg reported the Israeli government lashed out at the social media company for ignoring its requests to take down content that suggested violence towards the state. Facebook and Snap ended up 0.79% and 3.91% respectively. But while social media stocks had a good day, the Nasdaq finished down 0.26%. Twitter is up almost 33% year-to-date.